Both anorexia nervosa and bulimia nervosa are eating disorders that affect an estimated 8 million Americans, mostly women, though about 10% of those who have an eating disorder are men. Anorexics have an irrational fear of gaining weight and a distorted body image. They refuse to maintain a healthy body weight and are obsessed with thoughts of food, dieting and how their body looks, to the exclusion of other things, such as interaction with friends and family or the pursuit of hobbies. 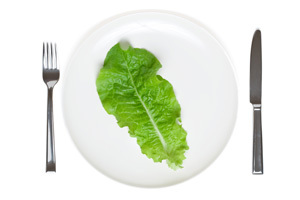 Dieting despite being underweight - Anorexics follow diets that severely restrict caloric intake. They may eat only certain low-calorie foods, refusing anything they consider a "bad" food, such as fats and carbohydrates. Obsession with calories, nutrition and grams of fat - They will measure the nutritional content of every morsel they put in their mouth and will obsessively read the nutrition label on each item they buy in the supermarket, rejecting anything with too many calories. They are likely to read every diet book they can find and may keep a food diary listing everything eaten throughout the day. Lying about eating - Anorexics may say they have eaten when they haven't, and will make excuses for getting out of mealtimes. They may feign illness, hide food or throw it away to keep from eating. Obsession with body image - Despite being severely underweight, they may see themselves as fat, weighing themselves constantly and denying that they are too thin. They may cover up with baggy clothes so their thinness doesn't show. Rapid, drastic weight loss is another sign of anorexia. Bulimia is an eating disorder characterized by regular cycles of binging and purging. The person suffering from bulimia will binge on food, consuming up to 5,000 calories in an hour, then will feel guilty and do all they can to purge the excessive calories by inducing vomiting, using laxatives or exercising fanatically. Lack of control over eating - Bulimics are not able to stop eating, consuming food to the point of stomach pain. Large amounts of food disappearing - Food may disappear mysteriously from the person's refrigerator, with no appreciable sign of weight gain. They may keep stashes of food hidden away for when they want to secretly binge. Going to the bathroom after eating - immediately after a meal they may go to the bathroom to vomit, possibly covering the sounds by running water in the sink. Vomit smell - either in the bathroom after a meal, or on their person, someone with bulimia may try to cover it up with air freshener or by using mouthwash or breath mints. Regular use of laxatives or exercise - they may use diet pills, diuretics or laxatives after eating, or do a lot of calorie-burning exercise immediately after a meal. Anorexia and bulimia can cause serious, long-lasting damage to health, so getting treatment for it is important. Of all mental illnesses, these are the ones with the highest rates of mortality, so if you suspect that you or anyone you know may have these illnesses, see a mental health professional as soon as possible.